Posted in Software, Updates at August 21st, 2016. 9 Comments. Microsoft has announced that the second update of Windows 10, the Anniversary Update, is going to be available on August 2. While the update is not available yet, there are rumors that the update will be based on Windows 10 build 14393, which is available for the participants of the Windows Insider program. Meanwhile, I have updated 7+ Taskbar Tweaker to be compatible with Windows 10 build 14390. There’s an alpha version available, which is functional, but not complete: some of the options still don’t work properly with the new build. Also, the alpha version might work for Windows 10 build 14393, but it wasn’t tested. Those of you who have donated can get the alpha version here (the link was removed). v5.1.9.2 (August 6): Implemented the Display seconds on the tray clock option, fixed the Hide the Start button option for 64-bit. v5.1.9.3 (August 13): Fixed the Combine grouped buttons option, fixed labels showing up for grouped buttons with the Don't combine grouped buttons option. v5.1.9.4 (August 19): Improved the combining options, implemented the tray_icons_padding advanced option for Windows 10, other fixes. Update (September 1): The first public beta version is available! Get it here. Update (September 9): Windows 10 Anniversary Update is fully supported by 7+ Taskbar Tweaker. Posted in Software, Updates at July 25th, 2016. 201 Comments. Have you ever wanted to copy some text from a dialog box which doesn’t provide such functionality? Textify was created to solve this problem: you can point your mouse over the text, click on the mouse shortcut (Shift + Middle click by default), and get a selectable view of the text. Posted in Releases, Software at March 5th, 2016. 329 Comments. Posted in Software, Updates at November 17th, 2015. 53 Comments. I’m happy to announce that Unchecky v0.4 is now available! This feature was requested since the first version of Unchecky was released, and I’ve been planning to implement it for a long time. Now, Unchecky is finally able to combat offers in the browser. Just like for native installers, the checkbox is automatically unchecked, and a warning is displayed when a checkbox with an offer is clicked. 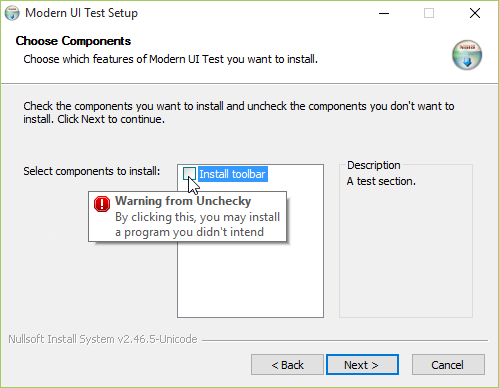 When you click on a button which causes an installation of a potentially unwanted program, Unchecky shows a warning message box. But until now, you could not know whether a button causes an installation of a potentially unwanted program before clicking on it. Unchecky v0.4 provides a new option, which allows to display a tooltip while hovering on such a button. That way, you can know which buttons to avoid even before clicking on them! The new option can be enabled in the Settings page of Unchecky. Posted in Software, Updates at October 12th, 2015. 8 Comments. Red: an address to a code block of a module. Magenta: an address to a non-code block of a module. Yellow: an address to a non-module memory block. Black: a handle of a window which belongs to the debuggee process. The colors can be changed in the .ini file. Limitations: double-words across rows are not processed. Posted in Releases, Software at August 28th, 2015. 4 Comments. 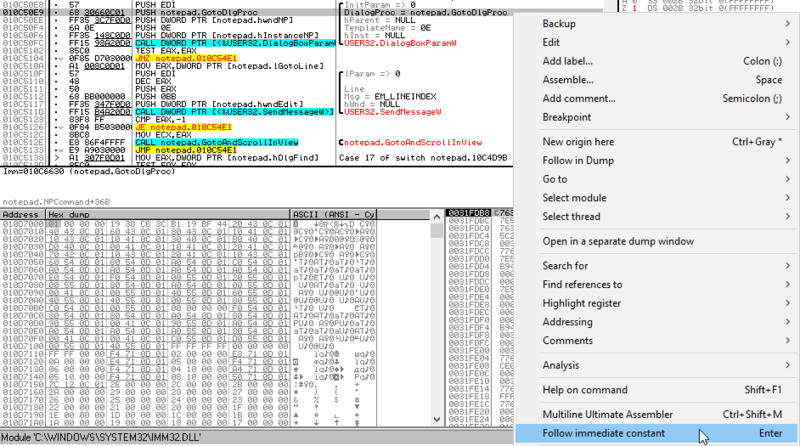 This plugin fixes a minor, but annoying issue with the CPU dump history navigation on OllyDbg 2. Posted in Releases, Software at August 28th, 2015. No Comments. Adds the missing option to follow immediate constant in OllyDbg 2, just like in OllyDbg 1.10. Posted in Software, Updates at August 28th, 2015. No Comments. Posted in Software, Updates at August 22nd, 2015. 49 Comments.